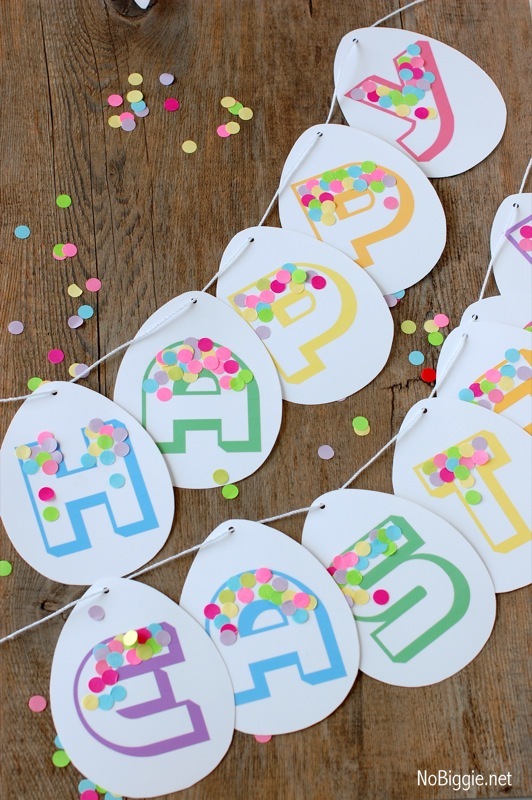 I’m loving confetti right now, so I thought a Happy Easter banner with confetti would be fun. 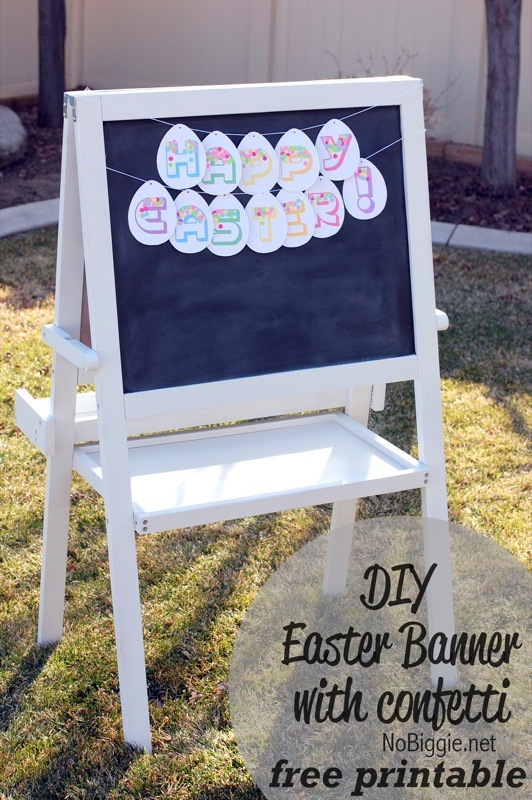 If you plan on hosting an Easter brunch or an Easter Egg hunt, this simple banner would make for a happy welcome. Here’s an easy way to get festive for your Easter Celebration. 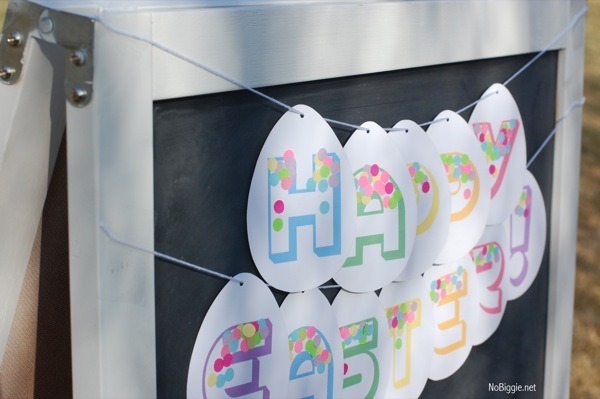 We love this simple Easter Banner…hang it up add a little confetti and you have a simple decoration for your Easter Egg Hunt. Pick up a little bag of pastel confetti to get the same look. Or better yet, make your own with a standard hole punch and paper scraps. Do you ever notice the color of envelopes that come via junk mail? If you ever find colored envelopes, they would be perfect for this, because you really don’t need very much. When I first started making this banner, I thought I could just spread some glue and dump the confetti just like you would with glitter, but it didn’t look how I wanted it to, so here’s a little of the How-To for this banner. 1. Print out all 3 pages of this printable. 2. 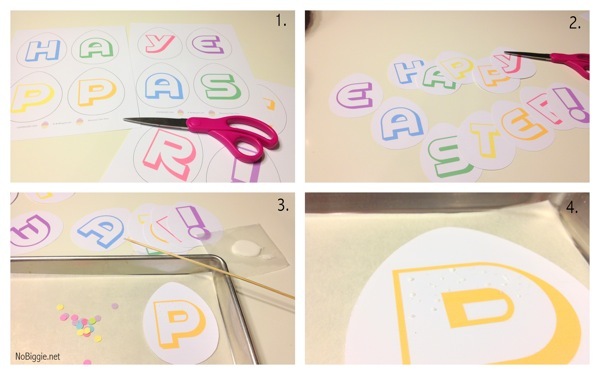 Cut each egg shaped letter out. I cut just inside the black outline of the egg. 3. In a small pan with a piece of parchment (for easy clean up) dump a handful of confetti onto the pan. 4. On a small piece of waxed paper, dump a little mound of white glue. With a long wooden skewer, poke the pointed end into the glue and dot it all over the letter where you want the confetti to stick. With the other end of the wooden skewer, dab it on your tongue to make the end wet to pick up the small circles of confetti. Working fast, place the confetti where you want it on the printed letter. That’s it! 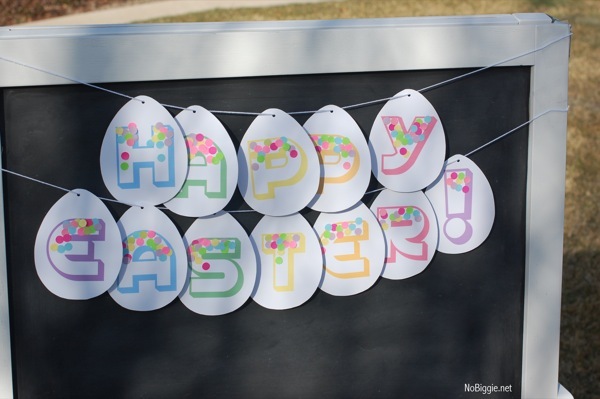 Now with a small hole punch, punch a tiny hole through each egg and string them onto a string for the banner.